The concept of culture I espouse, and whose utility the essays below attempt to demonstrate is essentially a semiotic one. Believing with Max Weber that man is an animal suspended in webs of significance he himself has spun, I take culture to be those webs, and the analysis of it to be therefore not an experimental science in search of law but an interpretive one in search of meaning. It is explication I am after, constructing social expressions on their surface enigmatical. The chief problem presented by the sheer phenomenon of aesthetic force, in whatever form and in result of whatever skill it may come, is how to place it within the other modes of social activity, how to incorporate it into the texture of a particular pattern of life. And such placing, the giving to art objects a cultural significance, is always a local matter.. But what is the significance of Material Culture to the study of the history and the philosophy of art? In the best Foucauldrian fashion, one must begin by noting what material culture is not. First, material culture is not connected in any way with Marxism. In fact, Marxism is never mentioned in the discourse of material culture, except to note in passing that Marxists object to Geertz’s lack of attention to issues of class and power. ..purist dogmas…of the material determination of consciousness on the social science side may have their uses…but…they head us off precisely in the wrong direction—toward an isolation of the meaning-form aspects of the matter from the practical contexts that give them life..
..adequately realized synchrony is more important to good historical analysis than adequately realized diachrony. In the eyes of professionals, it is more important for a historian to know how to suspend time than to know how to recount its passage. For a large class of cases–though not for all—in which we employ the word ‘meaning,’ it can be defined thus: the meaning of a word is its use in the language. ..that posthumous and mind-clearing insurrectionist, “The Later Wittgenstein.” The appearance in 1953, two years after his death, of Philosophical Investigations, and the transformation of what had been but rumors out of Oxbridge into an apparently endlessly generative text, had an enormous impact upon my sense of what I was about and what I hoped to accomplish…I am more than happy to acknowledge Wittgenstein as my master. ..cultural forms find articulation…in various sorts of artifacts and various states of consciousness; but these draw their meaning from the role they play (Wittgenstein would say their “use”) in an ongoing pattern of life, not from any intrinsic relationships they bear to one another. He was the first American anthropologist to employ a textual metaphor for understanding culture. In Geertz’s writings, however, we do not find a single, clearly articulated elaborate theory of the text..His textual metaphor emerges from a series of conceptual themes—it is not one notion of several orientations. 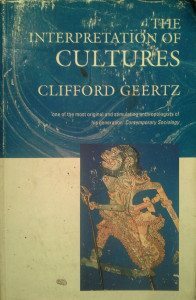 Geertz approaches cultural meaning through a symbolic or semiotic framework. He was particularly influenced by Susan Langer..Geertz defines cultural symbols as medals of and models for social reality. To be of effective use in the study of art, semiotics must move beyond the consideration of signs as means of communication, code to be deciphered, to a consideration of them as modes of thought, idiom to be interpreted…a new diagnostics, a science that can determine the meaning of things for the life that surrounds them.. It is a relationship of whole to parts…Meaning and meaningfulness..are contextual. One would have to await life’s end and could not survey the whole on the basis of which the relations between the parts can be determined until the hour of death. One would have to await the end of history in order to possess the complete material for the determination of its meaning. On the other hand, the whole exists for us insofar as it becomes understandable on the basis of the parts. Understanding always hovers between these two approaches. ..thick description is manifestly a quality of the explication rather than of the action or text that is explicated; it is not the object that is thick or thin but only the description of it. A thick description thus could be exceedingly straightforward or, alternatively, exceedingly complex, depending on the length of the chain of parasitical intentions and circumstantial detachments..Thickness is not the object; it is in the narrative surroundings, the add-ons, nested frames..Thickness is no longer seems extrinsic to the object, a function solely of the way it is framed. Clearly, Geertz, like many of his generation was formed from a mélange of cultural forces swirling around during the 1960s. During this fertile period, decades of thinking coalesced and philosophical ideas that dated back to the beginning of the century began to be assimilated and, having been digested, began to emit descendants in further thought. 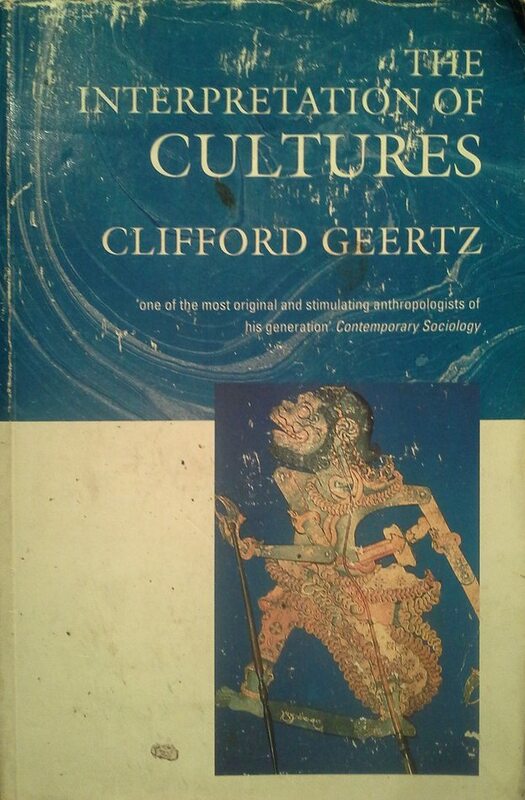 In his way, Clifford Geertz was a prototypical Postmodern thinker who assembled a coalition of concepts that allowed him to further anthropology and to take the new field in new directions, combining field work with philosophy, specifically semiotics. Material culture became a way to “read” a society like a text, but part of any society is its works of culture–art objets. Given a broad mandate as an anthropologist, Geertz would turn his attention to art and delved into the links between art history, art historians, philosophy and semiotics and philosophy–a complex combination of text and image, discussed in the next post.